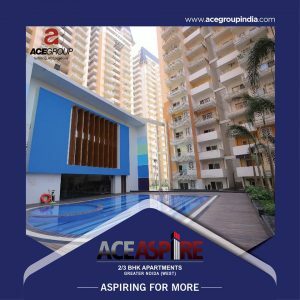 The real estate phenomenon Ace group has completed its finest residential destination named Ace Aspire, for people looking to invest in 3 bhk projects in Greater Noida West. This project is an ideal place for people who are planning for their dream home in Noida extension. And not only being a savior for Noida, but the location is convenient from all major parts of Delhi/NCR. All major shopping complexes and hubs are in close vicinity which also includes hospitals, commercials, eateries, schools & entertainment hubs. The project is already completed and has given timely delivery of all its units to the residents. This ultra-modern project comes with numerous facilities which are valuable and essential for experiencing a residential patience which is not so common these days. This 4-core building with share wall concept features 2 and 3 BHK condos surrounded with all kinds of facilities in a close locality. Roads around the project are properly built for maintaining a hassle-free life. In vicinity you can find top schools and many multinational corporate offices. With its most innovative plan as Ace Aspire, the group focuses on not only providing the best of a housing experience but also at the most modest prices. Ace group has always believed in delivering the supreme without exceeding the buyer’s limit. People often get confused while choosing over their dream home as the market place defines a dream home as something which could be pricey. The project features every facility in the premises with all your needs doorstep and at the most economical prices. The place can surely be the solution for people watching to Buy property in Greater Noida West.The group has previously also delivered the best of residential projects in Noida/ Greater Noida& is also constantly working towards the need of an ideal home buyer and investor/ financial specialist. Football: The world is watching… Are we?